This smokey patio weather-inspired Southwestern BBQ Mackerel Fish Sandwich is a bit of a big deal to me. Because when I’m craving a meaty fish burger of sorts, my options are *incredibly* limited. Oh sure, most burger joints have a fish option—but have you ever had one of those soggy pucks of mystery meat? They don’t sate your craving; they leave you in a confused self-loathing pile on the couch as you question your life decisions as an adult. When I made these crispy fish cakes late last year, I couldn’t get enough of them. I made them three times! And as I leaned up against the counter in the kitchen one afternoon savoring the last morsel, I thought to myself… how amazing would this be as a giant fish cake. Between two buns. In burger form. A calculated grin crawled across my face, and here we are. Southwestern BBQ Mackerel Fish Sandwich. When I started planning for this recipe, I was gunning for something similar to my crispy fish cakes with bright, lemony, and briny flavors. Maybe with a basil-infused mayo! But that idea is taking a backseat. Now that it’s grilling season, I’ve been seeing BBQ sauce-slathered burgers everywhere and the craving has been real. Not to mention the fact that you rarely see fish sandwiches and BBQ sauce paired together. If you’re thinking, “Well, maybe there’s a reason for that.” I’m telling you there isn’t. This fish sandwich drenched in my homemade lip-smacking BBQ sauce will make waves. Last year I made homemade ketchup for the first time and was immediately OB-sessed. Naturally, I had high hopes for this BBQ sauce and let me tell you: it delivered. If you prefer using your favorite store-bought sauce, that’s totally cool. But I wanted to bring an extra zing of big flavor to this burger by simmering up my own sweet ‘n smokey condiment. This fab fish ‘wich is crispy on the outside while maintaining a meaty, tender, and flaky middle. Panko bread crumbs and an egg are used as a binder so your fish patty stays in tact while you bread it, transfer it, flip it, and eat it. Any beef-eater knows that the best burgers are made with quality ingredients—and that doesn’t change with fish. If you’re wondering, why not salmon? 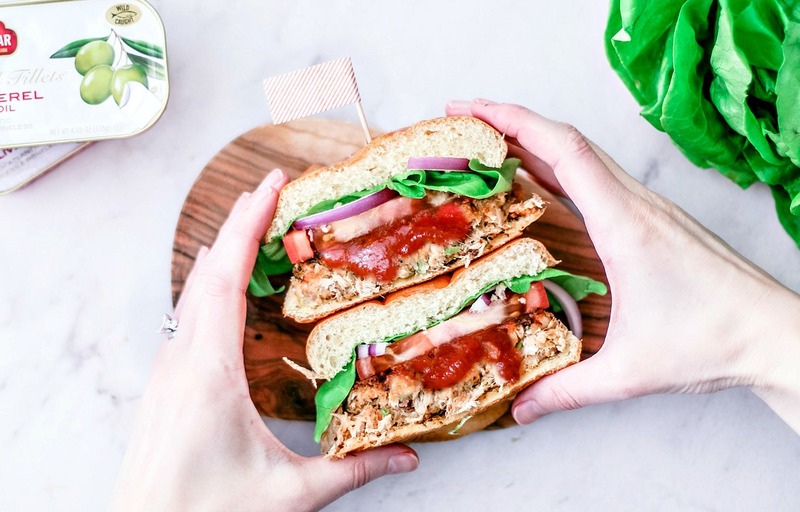 Salmon burgers work and they’re super healthy! So is mackerel, my friends! The National Oceanic and Atmospheric Administration states that every serving contains a healthy dose of protein, omega-3 fatty acids, selenium, and niacin along with vitamins B6 and B12. It’s no wonder the American Heart Association recommends eating at least two 3.5 oz servings of fish per week—especially fatty fish like salmon, albacore tuna, herring, sardines, and mackerel. Actually! One of my favorite healthy lunches, this Mediterranean Mackerel Protein Wrap, features King Oscar’s mackerel. You just can’t lose with good quality fish. Love Southwestern flavors? Check out my vegetarian Southwestern Sweet Potato Quinoa Burger! Find King Oscar near you with their store locator. This meaty sandwich brings tender mackerel and smokey summer flavors to your plate with Mesquite seasoning and homemade BBQ sauce. 2 4.05 oz tins of King Oscar Mackerel in Olive Oil, well drained You can reserve the oil for frying them later. Place all of the ingredients into a medium-sized saucepan. Whisk the contents thoroughly to blend well. Bring the mixture to a simmer over medium heat until the sauce is slightly reduced and develops a thicker consistency. If you'd like the sauce to be even thicker, mix 1 TBSP of corn starch and 1/4 cold water in a cup or small bowl. Whisk it until the corn starch has completely dissolved and slowly pour the mixture into the simmering BBQ sauce, stirring to mix. The sauce will thicken up. Remove from heat and set it aside to cool. Drain the mackerel; reserve the oil if you wish. You can use it for frying the patties later! Place the ingredients from the mackerel through to the cracked black pepper in a large bowl. Break apart/flake the fish with a fork and stir to combine the ingredients thoroughly. Add the beaten egg and 1/4 cup of the bread crumbs. Mix well. Grab about 1 cup worth of the mixture and form it into a solid patty. Place it onto the plate and repeat this with the rest of the mixture. Put the patties in the fridge for 30 minutes so that they can set. Once the patties are set, remove them from the fridge. Place the remaining 3/4 cup of Panko bread crumbs in a pie plate or shallow dish. (I added a little bit of Mesquite seasoning to the crumbs for extra flavor.) Carefully press one of the fish patties into the plate and coat with crumbs; press the crumbs to the patty to secure them and transfer the patty back to the plate. Repeat this step with the other fish patty; set them aside. Heat a large skillet over medium heat. Add 1-2 TBSP of olive oil (this is where you can use any reserved oil from the mackerel cans). Once the oil is heated, carefully transfer the patties to the pan and simmer for about 4-6 minutes on each side, or until they're golden brown in color. When done, transfer them to a cooling rack and let cool for about five minutes before serving. Serve on a bun with BBS sauce, crisp lettuce, tomatoes, onions, or any of your favorite burger toppers. I have never eaten mackerel and didn't even realize it comes in a can! Thanks for this dinner idea! I would love this recipe one morning when am not in a hurry,looks like a great sandwich. Thanks! It's a winner for sure.